I love Chicago any time other than the cold winter when freezing wind comes off the lake to take my breath away. My son lived and worked in Chicago immediately following his undergraduate years of college. We didn’t get to visit often but when we did, we enjoyed touring the art museum and the waterfront and finding unusual restaurants in the variety of neighborhoods around town. My Iowa daughter, 7 months pregnant, wanted a four day weekend away from her 2 ½ year old: away from work, household duties, and diapers. Just some relaxation and time for herself before baby #2 was born in June. She tried her best to recruit college friends, high school friends, and local friends to accompany her to Chicago for this weekend. No one could leave work or get out of family obligations – all of those things that make it difficult if not impossible for mid-30’s women to just “get away.” When her in-laws agreed to come to Iowa and help babysit, I promised to fly to Chicago and be the “friend.” I found us a great hotel bargain; we planned restaurant meals, shopping excursions, city tours. I even found a good airfare from Seattle to Chicago, a direct flight. So imagine my disappointment and dismay when two days prior to this planned trip I woke up with excruciating, debilitating back pain. Herniated disc. I could not even walk to the car let alone navigate an airport or airplane. Flat on my stomach, I could not stand or even roll over without screaming out in pain. The following day I endured an emergency steroid injection. I HAD TO CANCEL MY TRIP. I HAD TO DISAPPOINT MY DAUGHTER. That part made it more awful than the pain. Enter my savior, Sister Kay. She loves Rachel, Rachel loves her, they both love Chicago. Kay agreed to fly from Maryland to Chicago, and take my place for the four days. Done. Whew! 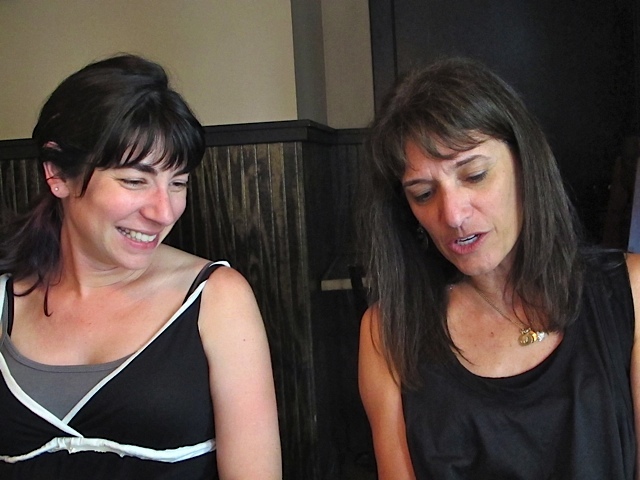 So even though I was in pain I knew Rachel was in great company (maybe even better company than the initial plan?). The two musketeers slept late, shopped together, ate amazing meals, and came home boasting of a cocktail they had than was made with St. Germain Elderflower liquor. I heard about said cocktail a LOT and looked up the restaurant menu, checked out the ingredients listed on the menu and made a very close approximation of this delicious martini. Pears remind me of fall, and this martini is GOOOOD even if you hardly ever drink martinis (I’m talking about Kay). Rachel and her hubby maintain that I write too much for my posts, so this one is short just for Rachel with only a couple of pictures! No description of the architecture tour, miracle mile, art museums, restaurants, shopping, sleeping. Just the facts, ma’am. Boil together water and sugar until sugar melts and everything liquefies. Remove from heat, cool and then stir in lemon and lime juices. This makes a lot more sweet and sour mix than you need, but keep it around for other uses. Place the martini ingredients in a shaker and fill to the brim with ice, Shake well, strain into a martini glass and garnish w/green grapes threaded onto a wooden skewer (see picture). This is a very light and sweet cocktail and I like to pair it with something a little savory – perhaps salted nuts or crunchy crackers with goat cheese. 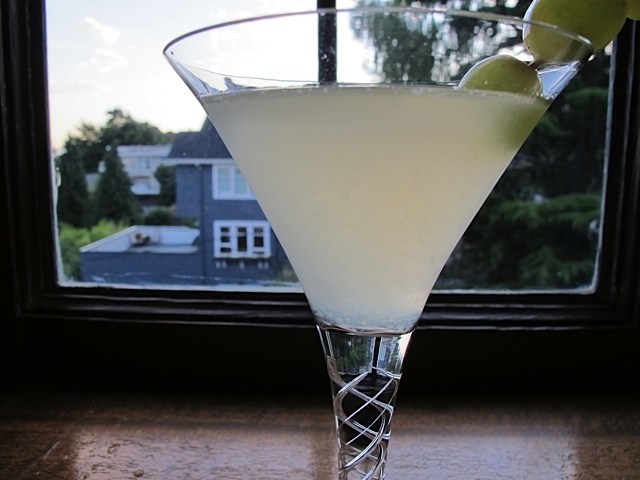 This entry was posted in Beverage, North America and tagged Chicago, Elderflower, Martini, Pear. Bookmark the permalink.